Obituary for Shirley E. Lovett | Kostanski Funeral Home, Inc.
Shirley E. (Hawley) Lovett, 94, of Turnpike Road passed away peacefully while surrounded by her family on Sunday 12/2/18 at the Buckley HealthCare Center in Greenfield. She was born in Boston on February 9, 1924, the daughter of George and Gladys (Sherman) Hawley. 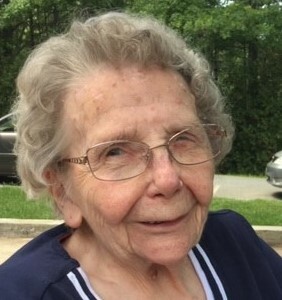 She went to work right out of Amherst High School in 1941, making rifles at the Springfield Armory as part of the war effort and then held several other retail and factory jobs, including working for Raytheon in Greenfield, where she moved in 1958 and would raise her family. She served as area director for the American Red Cross. After her retirement, she stayed involved with the local chapter into her late 80s, coordinating volunteers for blood drives in Franklin County. In 2006, she received The Recorder's Citizen of the Year award which honors individuals who selflessly work to help their neighbors and community. In addition to over 25 years of service with the Red Cross, Shirley served as a volunteer at then Franklin Medical Center clocking over 2,300 hours. She knitted hundreds of winter hats, scarves and mittens as well as baby blankets and donated them to local charities and organizations. Shirley enjoyed sewing, baking, reading, knitting and volunteering. Above all, she cared deeply for people - her family, her friends and her community. Among her survivors, Shirley leaves four sons, Stephan and his wife Norma of Greenfield; Gary of Greenfield; Terry and his wife Deanna of Northfield; and Richard of Turners Falls; two daughters, Joyce Morin and her husband Kenneth of Turners Falls; and Brenda Dedinas and her husband Alan of Greenfield; a sister, Ruth Gaither of Alabama; thirteen grandchildren, Kimberly, Christopher, Michelle, Corey, Kyle, Matthew, Timothy, Jessica, Andrew, Michael, Sam, Christopher and Shaun; and eight great grandchildren, Kate, Jack, Grace, Charlie Jean, Mason, Alexis, Lauryn and Kade. Shirley was predeceased by her husband, Howard F. Lovett on May 28, 1991. Funeral services will be held Friday 12/7 at 10am at the Kostanski Funeral Home, 220 Federal Street, Greenfield. Burial will follow at Green River Cemetery in Greenfield. Calling hours will be held Thursday evening from 4-6pm at the funeral home. Memorial contributions may be made to the American Red Cross, Pioneer Valley Chapter, 506 Cottage Street, Springfield, MA 01104 or to the Friends of the Franklin County Regional Dog Shelter, 10 Sandy Lane, Turners Falls, MA 01376 or to the charity of the donor's choice.